I’m a pasta lover through and through. And while I have a penchant for noodles drenched in buttery cream and topped with a mountain of cheese, I’m always keen to discover new delicious ways to reimagine my favourite dishes in a more healthful way. Fettuccini Alfredo was one of my go to’s when ordering out at a restaurant as a kid. Slippery noodles were tossed in garlic cream, topped with grilled chicken and a generous sprinkling of parmesan cheese. Today I’ve reimagined the combination by taking my flavours to the Mediterranean. I’ve swapped that butter muddled cream for a smooth hummus sauce, and added a punch of flavour with the addition of sun-dried tomatoes, kalamata, and crumbled feta. Toss your grilled chicken with a herbaceous and nutty pesto and you’ll be twirling this dish for family and friends all summer long. 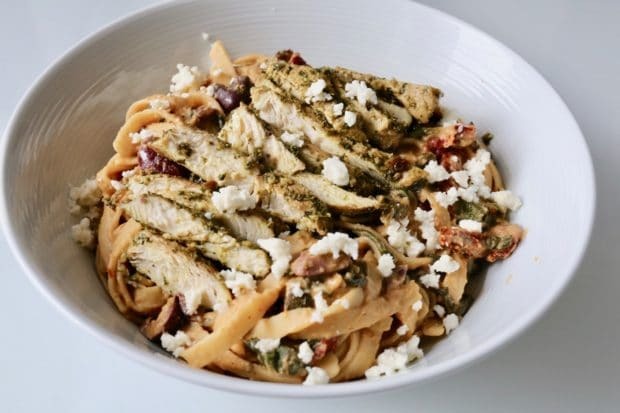 Our Creamy Mediterranean Hummus Pasta with Pesto Chicken recipe offers a healthier alternative for Fettuccini Alfredo fans. Barbecue your chicken breasts and then let cool in your kitchen in a medium bowl. Toss chicken breasts in pesto and slice when cooled. Cook fettuccini in a pot on medium heat until al dente. Strain and rest noodles in the sink. In a large frying pan add oil and cook garlic and onion on medium heat until golden brown, 3-5 minutes. Add sun-dried tomatoes, kalamata olives and spinach, stirring for 3 minutes until your spinach has wilted. Add hummus, lemon juice, white wine, and chicken stock, stirring slowly until fully incorporated and reduced, 5-7 minutes on medium/low heat. Once your sauce has thickened add cooked fettuccini to your pan and toss to fully incorporate. 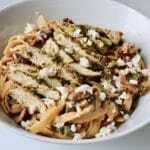 Serve noodles in individual bowls and top with slicked chicken breasts and crumbled feta.